If a square is rotated in fred's world, it rotates around a single point. This means that only a single point on the square stays at its original location as the square spins around. Thus, the axis of an object in planespace is zero-dimensional. Now imagine that Bob has Fred's world resting flat on a table. 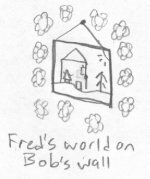 Bob has placed a cube on Fred's 2d world, as if the cube is a paperweight to hold down Fred's world from fluttering away in the wind. Fred's world is sandwiched between the table and the cube paperweight. The bottom surface of the cube, which is intersected with Fred's world, appears to Fred to be a simple square. If this cube is rotated, it appears to Fred as though a square is rotating around a point. In reality, it is a cube rotating around a line, whose axis extends perpendicular to Fred's world from the point of rotation. This means that all of the points along the axis will stay at their original location as the cube spins, but every other point in the cube will move in a circle. Thus, the axis of an object in realmspace is one-dimensional. Now imagine that Emily lays Bob's world flat on a tetral table. The direction towards the table from Bob's world is delta (down in tetraspace), and the opposite direction into the air above the table is upsilon (up in tetraspace). Emily places a tetracube on top of Bob's world on the upsilon side of it. Bob's world is now sandwiched between the tetral table and the tetracube. The tetracube is intersected with Bob's world, so Bob sees a cube floating in mid-air. Now let's say that Emily rotates her tetracube around one of it's edges. Bob will only see a cube rotating, but the tetracube it's attached to is rotating with it. The axis of rotation for the tetracube isn't a line, though. 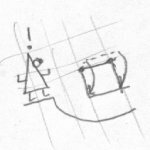 It's a plane formed by extending the linear edge of the cube into Emily's world, perpendicular to realmspace. All of the points on this square stay in place as the tetracube rotates in tetraspace. Thus, the axis of an object in tetraspace is two-dimensional. But, this is not what really happened. It is merely a futile attempt of Fred's to understand what's happened in the third dimension using only what he knows of the second dimension. The effects of Bob's actions are easy to see, but explaining them to Fred is not. As we know by looking at Fred's example, the size and shape of the square don't actually change as it's rotated through realmspace. The only ways that Fred has thought of to explain what happened involve the square changing shape. The real event doesn't require the square to change shape at all. It is the same situation with the cube. As it is rotated through tetraspace, the actual shape of it isn't changed at all; it remains a perfect cube. The only way we can imagine the result, however, is by distortions in realmspace.